Raintree Restaurant of St. Augustine and Dianne Thompson Jacoby can offer your group an historical dinner theater experience. 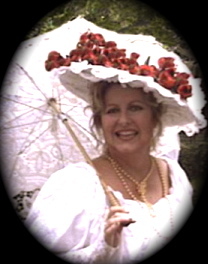 A Stetson University’s Elderhostel/Road Scholar, Dianne is an Historical Dramatist who performs one woman dramas. All shows are available full length and luncheon length. to reserve a dramatic culinary experience for your group. The story of empire builder Henry Morrison Flagler comes to life in this historical drama in three acts. Henry’s tremendous drive and magnificent accomplishments during Florida’s glorious Gilded Age are seen through the eyes of his three captivating wives as each beautifully gowned lady tells of her years with the man who took the blank canvas of Florida and created a rich man’s paradise. Each woman loves Henry in her own way. The devoted but sickly Mary Harkness, mother of his children, stood with him as he founded Standard Oil. Because of Mary’s chronic ill health Henry takes her to the wilds of Florida. Although Mary tragically dies of consumption Henry always yearns to return to St. Augustine to create a winter paradise for the wealthy. Devastated, Henry seeks consolation in the arms of the frivolous and high strung Ida Alice Shourds. Soon Mr. Flagler returns with his second wife to the wilderness of Florida and begins building magnificent grand hotels as his new wife lavishly entertains. Henry builds a string of lavish hotels and a railroad line, but sadly, amidst all the gaiety of the elite social scene, mental illness begins to claim Ida Alice’s sanity. As she spirals into insanity Mr. Flagler meets a wealthy and young heiress who captivates him, Southern Belle Mary Lily Kenan. A scandalous divorce ensues. Henry’s 34 year old third wife, soon weds 71 year old Henry Flagler, by this time the most powerful man in Florida. Twelve years after their marriage Mary Lily became the wealthiest widow in the world. Each unique woman shares her experience, strength and hope as Mrs. Flagler. Meet Henry Flagler as only his wives knew him. This show can be performed in a shorter format with just one wife. Dianne is a fourth generation Floridian living in St. Augustine, the Oldest City where she lectures, performs and coordinates Stetson University’s Elderhostel/Road Scholar programs for Stetson University as an adjunct professor. She is also a graduate of Stetson University. As an Educator, she taught for many years and was an adjunct professor o Art at Flagler College for ten years. As an Artist, Dianne has exhibited her paintings throughout the United States, she is now specializing in portraits and custom mural painting. As an Historical Dramatist she researched, wrote and performs one woman dramas. She is a founding member of St. George Players Theater Troupe performing 16th century Comedia and Mummers shows. She also performs dinner theatre, mystery theatre as well as historical films and educational videos. 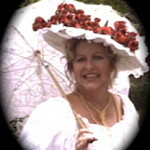 As a historical re-enactor she interprets personas from the 1500’s through the Victorian Gilded Age. She serves as a consultant and educator in the area of historical clothing and costuming. She has National Park Service certification in black powder cannon and musket. Her special interests include Historical preservation and heritage tourism.